David R. Bolla, DDS, and James P. Cotter, DDS, are cosmetic dentists who understand the allure of a bright, white smile. Our Port Huron dental office offers take-home teeth bleaching gels that you can use to achieve the perfect shade of white. Teeth whitening from our Port Huron cosmetic dentistry office is a popular treatment for combating the effects of highly-pigmented foods, age, or even excessive fluoridation during tooth development. 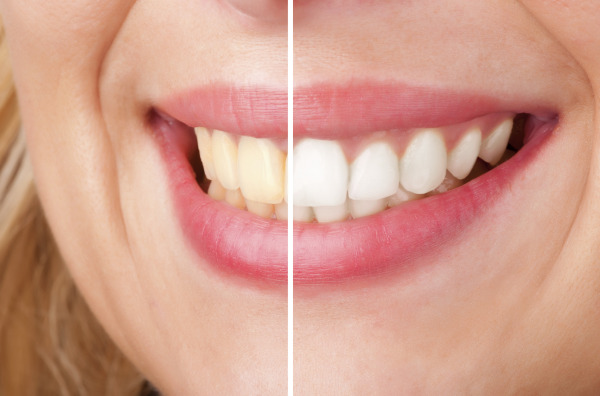 Teeth bleaching is a simple, non-invasive dental procedure that can improve the appearance of your smile by brightening it to a fresh shade of white. In fact, the primary aesthetic concern of most adult dental patients is stained teeth. Fortunately, take-home teeth bleaching is a practical, effective choice. However, teeth whitening gels only work on natural tooth enamel -- if you have crowns, composite fillings, bonded teeth, caps, or other restorations, the materials used to restore your teeth will not be affected by the gel. Thus, you'll want to discuss how teeth whitening may affect your restoration work. If it becomes necessary to replace your restorations, your dentist will recommend doing so after bleaching so that the new restorations will match your freshly-whitened teeth. Dr. Bolla and Dr. Cotter use Ultradent Opalescence teeth whitening gels from their Port Huron dental office. The process typically takes place over two appointments. First, you'll come in and have impressions made of your teeth. These molds will be used to create custom plastic trays that fit over your teeth. Once the trays have been made, you'll come in to ensure that they fit properly and learn how to use the trays in conjunction with the Ultradent Opalescence teeth whitening gel. You will wear the trays for several weeks, either overnight or for 30 minutes twice a day. How long or how frequently you'll use the trays depends on how much staining is present and the shade of white you want to achieve. Expect some tooth sensitivity during the teeth bleaching process. This will subside after you complete your treatment. Over time, your teeth may gradually become discolored, especially if you continue to drink wine, coffee, or tea or smoke. Fortunately, touch-ups can quickly brighten your smile every few years. Are You Ready for a Brighter Smile? Contact Us Today! If you want brighter, whiter teeth in Port Huron or Marysville, MI, schedule an appointment with Dr. Bolla or Dr. Cotter to discuss teeth whitening treatments to effectively freshen your smile.